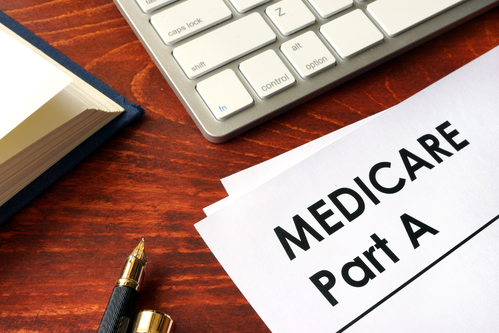 The Supplementary Fund, which consists of Medicare Parts B and D, collectively helps pay for physician, outpatient hospital, home health, and other services for the aged and disabled, and for subsidized access to drug insurance coverage. The Supplementary Fund is financed by premiums paid by Medicare Part B and D enrollees and, therefore, is not dependent on workers' earnings. In 2017, Medicare covered 58.4 million Americans--49.5 million age 65 and older, and 8.9 million disabled-and its expenditures were $710 billion. The Trustees report that the Supplementary Fund is expected to be adequately financed into the future because Medicare Parts B and D premiums and general revenue are reset each year to cover expected costs. The Hospital Fund, on the other hand, is estimated to be depleted in 2026, three years earlier than projected last year. The Trustees attribute the worsening state of affairs for the Hospital Fund to (i) increasing Medicare Part A expenses, (ii) lower payroll taxes due to lower wages for 2017, and (iii) lower income from the taxation of Social Security benefits as a result of legislation. The Trustees state that they expect revenues to the Hospital Fund to fall short of expenditures in ALL future years. Consequently, the Hospital Fund does not meet either their short- or long-range requirements for financial adequacy. But what to do? The Trustees note that their projections for the Medicare program reflect substantial, but uncertain, cost savings deriving from provisions of the Affordable Care Act [aka Obama Care] and other legislation that lowered increases in Medicare payment rates to most health care providers. But more needs to be done. The Trustees urge Congress to find more and better solutions to reducing the rate of growth in Medicare costs, and to do so as soon as possible. They note that the sooner reforms are enacted, the more flexible and gradual they can be. Earlier reforms also give all interested parties more time to adjust their systems, behaviors, and expectations. The time is now. The matter is urgent.